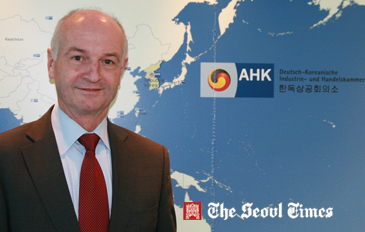 Juergen O. Woehler is the lawyer-turned-German-business-official who loves Korea. Since his wedding to a wonderful South Korean woman in 1987 he has been spending most of his professional life in the Far Eastern nation. Woehler has been serving as secretary general and executive director of Korean-German Chamber of Commerce and Industry (KGCCI: AHK), Seoul (Korea) since April of 2007. But it was way back in 1987 that he first started working for the German chamber as KGCCI’s Seoul director. He was in charge of the department of investment and legal affairs in KGCCI’s Seoul office for two years. It was also during this period when he met his “better half,” Kim Mi-Kyoung, his current Korean wife, who now serves as president of Asia Circle. During the ensuing two decades or so in Germany Juergen also involved himself with South Korea as a board member and chairman of the German-Korean Business Association. He was also Korea country committee chairman of the German Asia-Pacific Business Association and board member of the German-Korean Society. Woehler was highly instrumental in helping young German businesspeople getting acquainted with the Korean business culture. For this he used publications, interviews as well as lectures. For all his efforts for and dedication to the development of bilateral relations between Germany and South Korea Woehler was recognized twice from the Korean government and once from his own country (see below for details). Between 1995 and 2007 he chaired the German-Korean Business Association. As Woehler’s influence got widened and his reputations well-known in South Korea, a quality academic institution of higher learning in Seoul tapped him as its honorary faculty member a year and a half ago. He has been offering special occasional lectures for the local collegians at the Hankuk University of Foreign Studies in Seoul up until now. He never lost the adjunct professorship of the university in spite of his quite hectic work schedule. From 1987 to 2007 he worked as executive vice president of Landesbank Baden-Wuerttemberg in Germany’s Stuttgart. Woehler started his professional career as attorney at law. He worked as a junior lawyer, a position of the German government in Stuttgart from 1978 to 1981. He passed his bar exam in 1980. Woehler clinched a chance to study in the neighboring country. In 1978 he received a diploma in comparative law from the University of Strasbourg in France. A year earlier he was a research fellow at Georgetown University in Washington DC. From 1972 till 1977 he studied at the University of Tubingen in Geneva. He majored in law at the university. He also studied history and politics, and economics there. In 1970 volunteered to serve in the German army. He completed his military service as an office within two years. His rank has been a major in the reserves since 1987. Woehler is the recipient of several prestigious awards from the governments of South Korea and France as well as his own country for his contributions to the development of mutual ties and cooperation particularly in business area. Two years later he was awarded by Korean government “Sungrye Medal for Diplomatic Service Merit. In 2010 he received “Korean Presidential Citation” at Chongwadae or the presidential Blue House. A year earlier he was awarded the Cross of the Order of Merit of the Federal Republic of Germany ("Bundesverdienstkreuz amBande") by German President Horst Koehler for promoting German-Korean relations. Woehler has authored several books including “Markte Ostasiens” (1997), “More Profit-Less Risk” (2005), and “Korea auf einen Blick”(2007). Somewhat composed Woehler actually enjoys many kinds of sports. He likes running in all seasons and go skiing in winter. Sometimes he enjoys golf or tennis with his friends. Juergen O. Woehler was born on May 10, 1950. He is married to Kim Mi-Kyoung and they have four sons. His oldest son is now studying Yonsei University in Seoul. The Korean-German Chamber of Commerce and Industry (KGCCI) is your first contact in Korea. It began operations in Seoul in1981. The Chamber fosters economic relations between the Federal Republic of Germany and the Republic of Korea, steadily expands its activities and adapts them to the changing customer demands. Today, the KGCCI has more than 540 member companies representing all types of businesses. The KGCCI is an experienced and proven partner for Korean and German companies. KGCCI offers professional, comprehensive and customer-focused services. Furthermore, KGCCI is the official representative of the Korean-German business world, e.g. at official bilateral consultations. With its numerous networking activities, the Chamber also is the central German business club in Seoul.